Then after lunch, cut off the 30 best blooms, remove their pistils(?) and wash and store in paper towels in the fridge. Use the other squash flowers in a pinakbet or other dish. 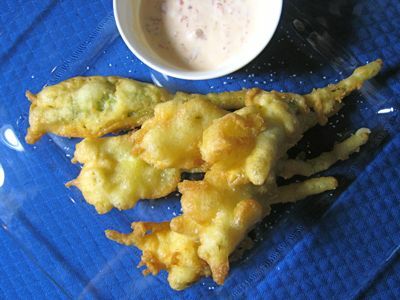 Then make the lightest, most ethereal fried squash blossoms served with a simple dip. This is always a crowd pleaser, and without any stuffing of pricey mozzarella or good anchovies, this is incredibly well-priced as well. To make the batter, you will need 3 large egg yolks, 1 and 1/2 cup of sparkling water (soda water okay), we used San Pelligrino only because we had an open bottle, but it wasn’t necessary. 1 and 1/2 cups of all purpose flour and some salt and pepper. Beat the egg yolks with a whisk for about 30 seconds then add the sparkling water and beat another few seconds. Add the flour and mix well. You can add a touch of salt and pepper to the batter. Let this cool in the fridge for 10-20 minutes while you heat up the oil in a frying pan. Then, dip some of the squash flowers in the batter and put into hot oil until just golden and drain on paper towels. Sprinkle with salt and pepper. Where are you? Are you OK? Am still waiting for your new e-mail address….THE RED CHINOOKS ARE ON THEIR WAY!!!! It’s Indian Candy Smoking Time, Silly LOLO…. Hi MM. Why soda or sparkling water. Can I use ordinary water instead….Thanks! I always look forward to squash blossoms. If you’re careful to pick only male flowers (leave a few, of course) you can enjoy blossoms and fruit from your garden. The female blossoms have a tine squash at their base. One thing to beware of. After I battered some blossoms, one was moving & buzzing. I found a rather angry honeybee inside. A variation I learned from friends in Mexico–squash blossoms and cheese in quesadillas made with corn tortillas. Also, squash flower soup is delicious. I miss this. good for dinengdeng,oh yum! 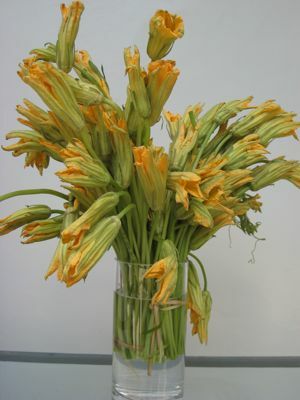 now this is a different take on squash flowers for an Ilocano like myself because the only dish i know that has squash flowere in it is the dinengdeng..i’ll most certainly try this.. MM, how will it affect my batter if i use plain water instead of sparkling water? bedazzle and chichay, the soda or sparkling water is supposedly to make the batter lighter and crisper when fried up. You can use plain water, but the batter may seem heavier, doughier. Youmight try both, say a plain one and a soda water one for comparison to decide if its worth spending for the soda water… kurzhaar, those variations certainly do sound delicious. Mike, imagine eating a fried bee? Nasty, I would imagine. Not to mention the bad vibes from frying him up alive. Kate, this tastes very light and crisp and a bit salty… then it also depends on the dip that you use… betty q, now that you mention it, it has been a while since Silly Lolo has posted a comment. Could he be on vacation? nice. but i don’t see this in our markets here. Is it legal to deflower a kalabasa patch? MM. . . why do you remove the pistil? wil-b, every recipe I have read for this instructs the reader to remove the pistil, but I don’t know why, maybe it is slightly bitter? Lee, silly, they only sell the male kalabasa flowers, the female ones turn into squash! MM, will it help if i add baking soda to the plain water? A sprinkling of parmigiano reggiano on the squash blossoms is also nice. i cooked the flowers dipping them with egg, flour and panko, and fried them. they turned out really light and delicious…just like tempura! i served them with the tempura dipping sauce…heaven!! Baking soda or powder may be added. May i suggest the substitution of beer for the carbonated/soda water. 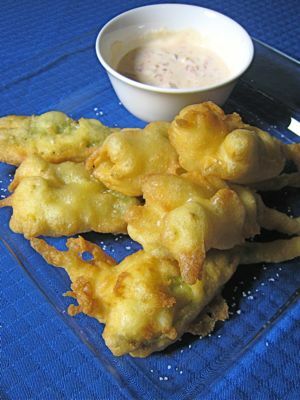 Beer batter is a common enough recipe for that fizzy quality and light batter. Great for onion rings too! i’ll do this as soon as i get to my beach house in pandan, antique. where in my backyard,there’s an abundance of squash. hahaha lee..i like that..but MM is right, the male kalabasa flower will wilt easily so you should be quick to pick it up to be able to make use of it, while the female ones you can distiguish easily because you can see a baby squash in it. in fact, the male flowers are used to pollinate manually the female kalabasa flowers. how about grilled tortilla with squash flowers and mozarella and a little pork fat?